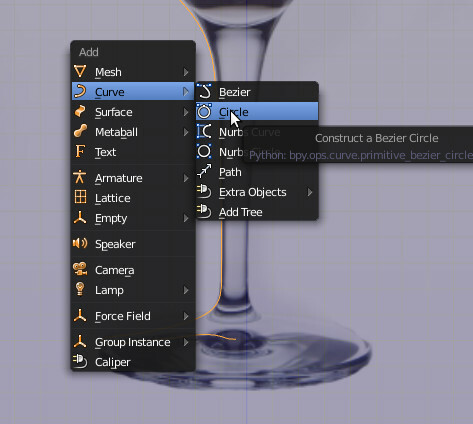 One of the most powerful toolsets in Blender are the various curve tools, and the curve modifier. With a few clicks you can introduce some serious changes to your model, warp space and time to your heart’s content and build a 1:1 replica of the Death Star in your fish tank. In a parallel universe. 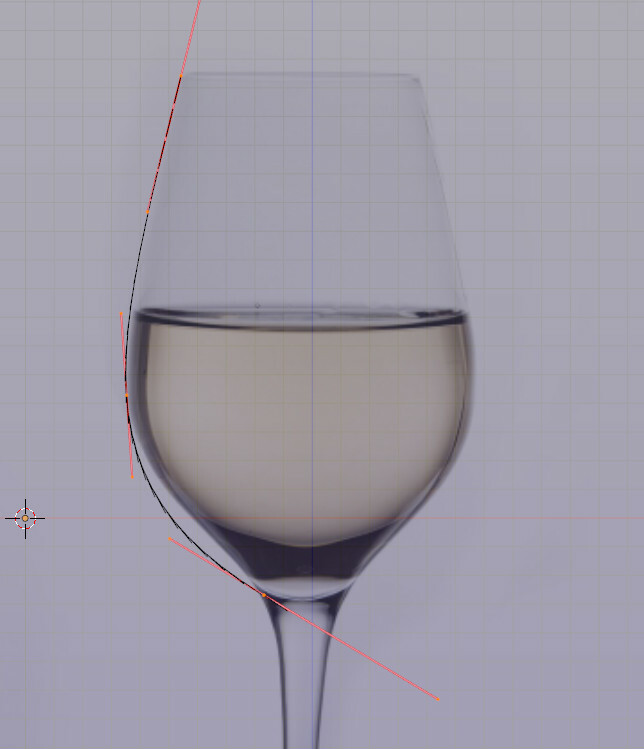 Allow me to demonstrate by creating a wineglass using curves (no Death Stars were harmed during this construction of the tutorial). 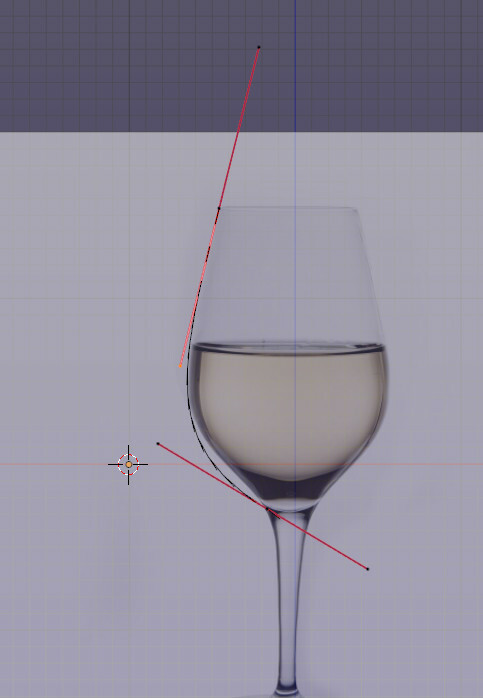 The wineglasses below were modelled by me using this technique, and you can find the file on Blendswap. You can skip past the blow-by-blow account by collapsing each paragraph that has an upwards pointing chevron at the beginning. 1. 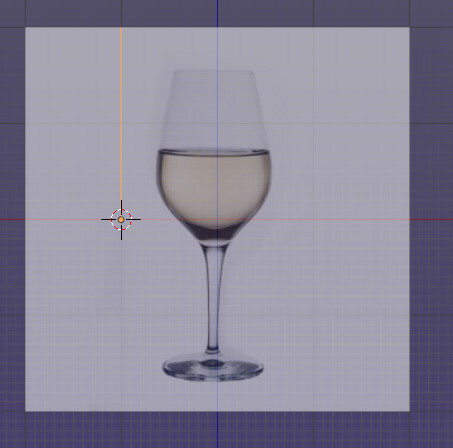 Find a picture of a wineglass to use as a reference and load it as a background image into your scene. 2. 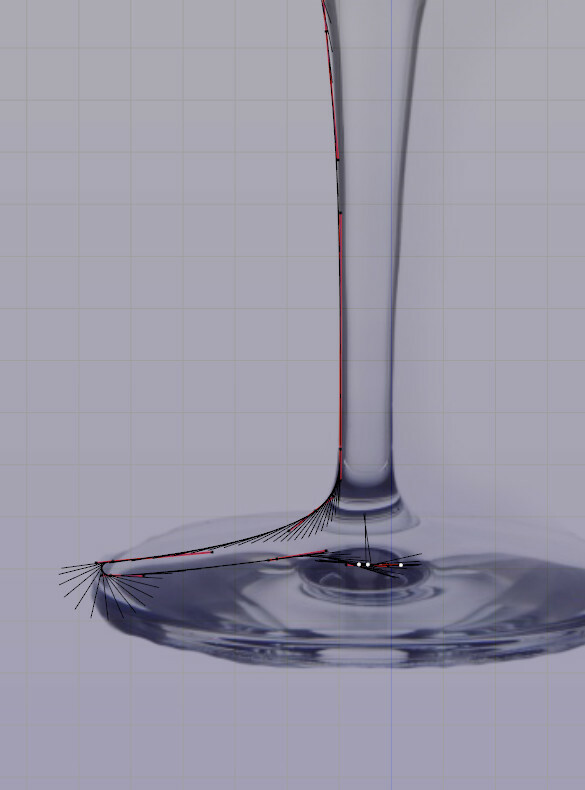 Create a wineglass cross-section, but only one half. Start in front view, by pressing 1 on the numpad. 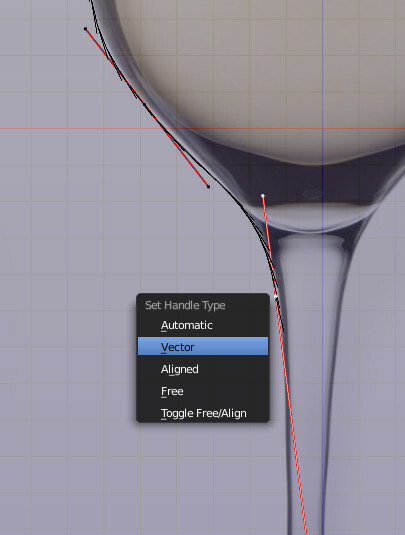 Add a curve, by hitting Shift-A and from the Curve menu selecting “Bezier”. I know, the image shows Circle as hifglighted. The one you want is just above. Now switch to top view by pressing 7 on the number pad. You will find that you have a curved bezier. 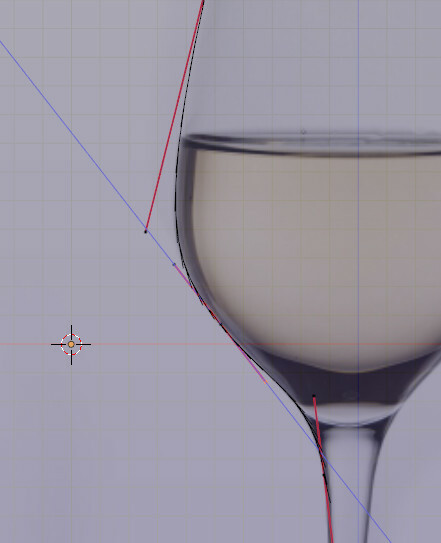 In all likelihood, it’s not going to look like a wineglass out of the box. So we need to tweak to our needs. I am in the habit of taking of few preliminary steps, which makes things easier for me in the long run. Press Tab to get into edit mode, and then select the left-hand node. Tap Z R -45 to rotate the node, so that we have now have a straight line. Notice that the origin of the Bezier – the small orange circle – is in the middle. This next step is also not essential, but it will make life a lot easier. Press Shift-S and then select Cursor to Selected. 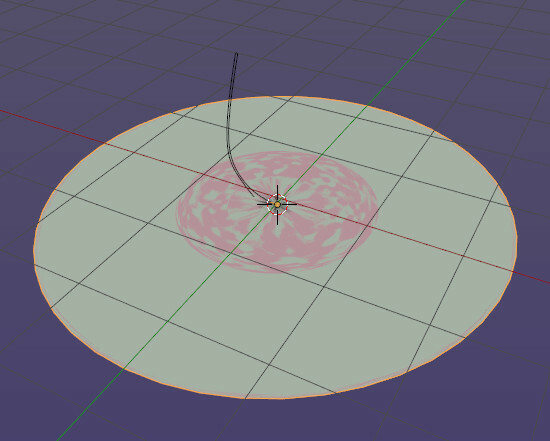 This will move the 3D cursor to the node we just rotated. Now press Tab to get out of edit mode, and press the Object Tools/Origin button, which you will find in the “T-Panel” on the left of the viewport (press T to reveal it). 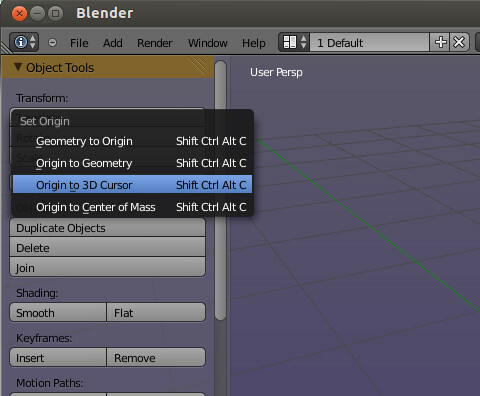 Select the “Origin to 3D Cursor” option. 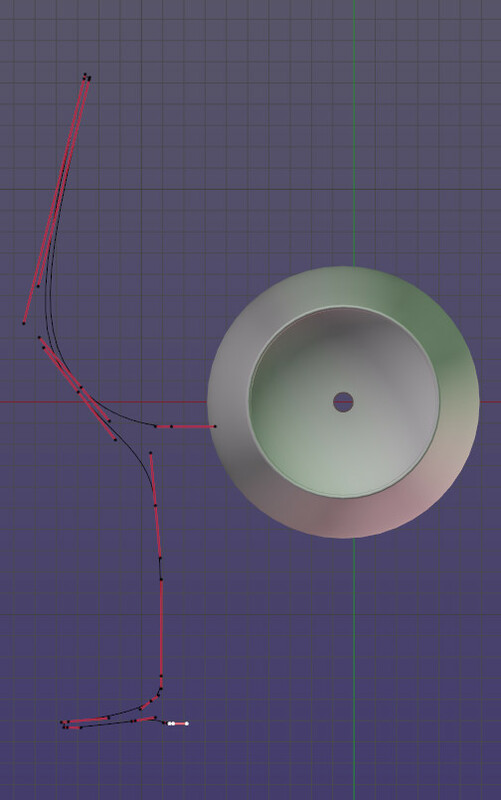 What this will do is move the origin of the Bezier curve to the left-hand node. This is not essential, but as you might discover for yourself later on, having the origin right on the start node is jolly useful. Also worth noting are the black chevrons that are arrayed left-to-right on the curve. 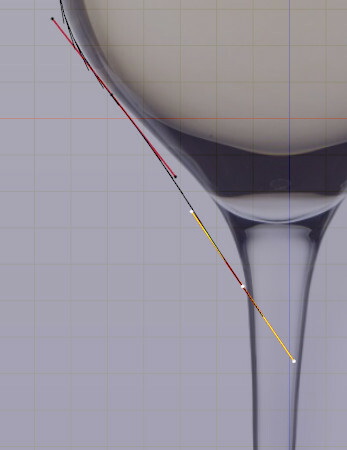 These point in the “direction” that the Bezier curve is in. Not immediately obvious, this does play a role in certain circumstances, which is why I am in the habit of placing the origin at the “start” of the curve. 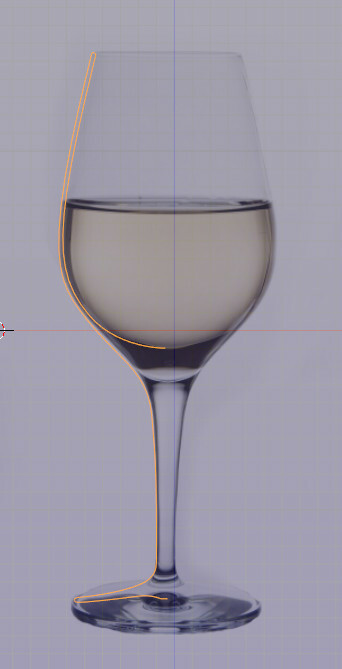 Now it’s time to crack your knuckles, because we are now going to create the semi-profile of a wineglass. 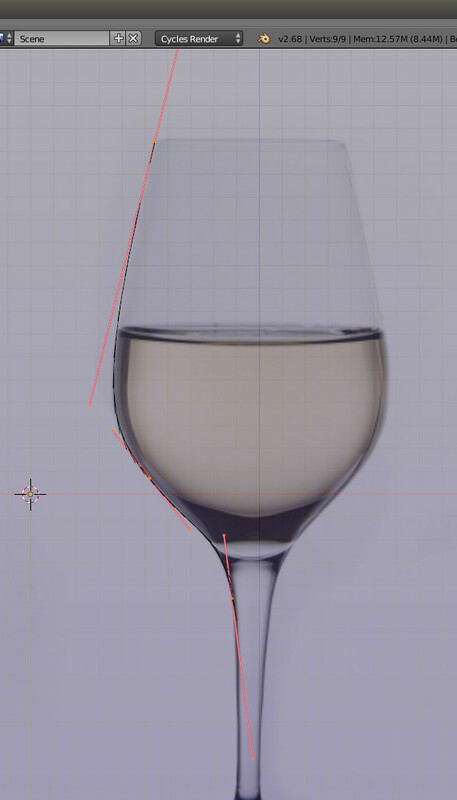 First, let’s load a reference image in the view port to make it easier to design a realistic-looking glass. In the N-Panel, select the “Background Images” checkbox, and then click on the “Add Image” button. You need to press the Open button and select an image. 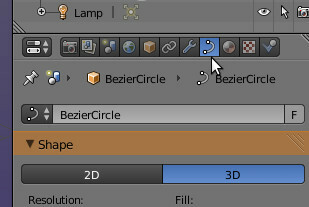 Like almost everything in Blender, once you have an option activated, you get a bazillion buttons showing up. You can leave them as they are. Press 1 on the number pad to get into Front View and then press R -90 to rotate the bezier curve so it stands vertically. 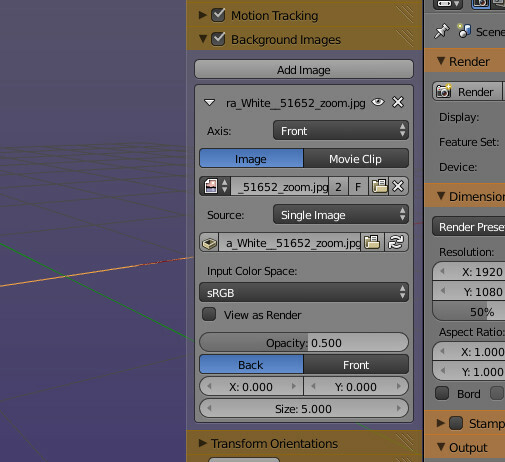 Tab into edit mode, and move the nodes into position as per the next picture. You will notice that the curve does not match perfectly. That’s because another node is needed to get that perfect fit. Select both nodes either by pressing A until they are both selected, or by Shift clicking the main mouse button (MMB) on the second node. 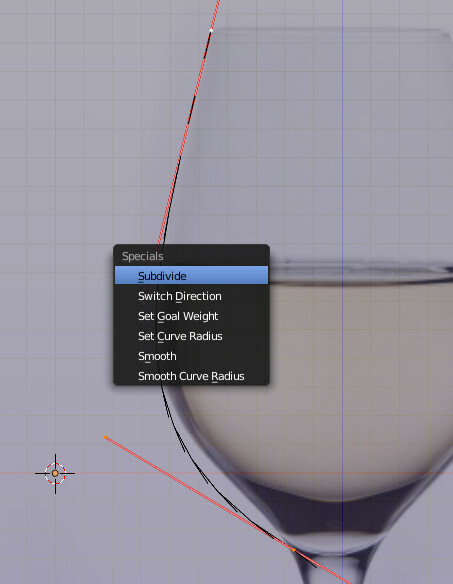 Now press W and select “subdivide”. This results in a new node being inserted in between the first two. The cool thing is that it does not change the shape of the curve at all. Now you need to fiddle with the curve to get it to fit. This is very tricky to get the hang of at first. Note that you can lengthen and shorten the handles independently, as you can see in the next image. There is a really useful wrinkle you might want to try out. Supposing you wanted to lengthen a handle without changing the direction it is pointing in. You could just carefully drag it in that direction. It might work; then again it might not. 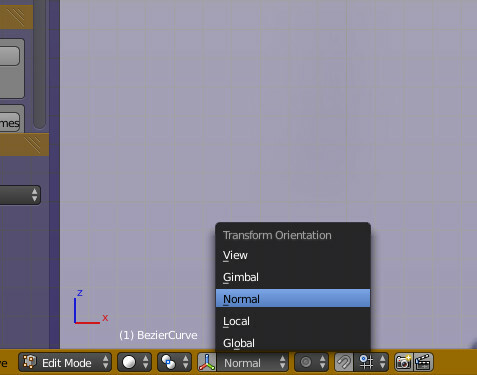 At the bottom of the viewport, there is a drop-down (well, in this case a drop-up; but you know what I mean) entitled “Transform Orientations” when clicked. If you select “Normal”, you can click on a handle, press “G” and then “Z” and “Z” again, and then watch how the handle moves along the Z-axis of the handle. Now that’s jolly useful. 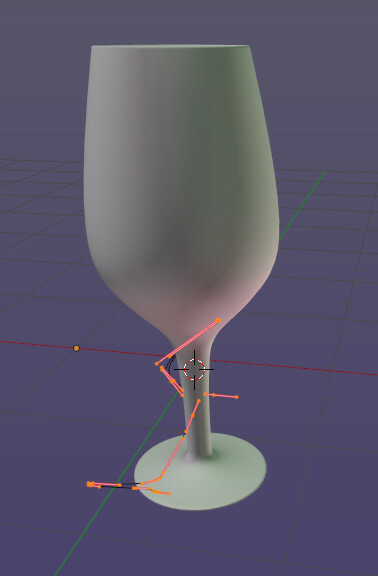 We need to extend this curve now, so select the lower node, and press E to extrude another node. As you will notice, the extruded node looks exactly like the node it was extruded from; the handles are the same length, and are oriented in the same direction. This results in a lot of fiddling around every time a node is extruded. There is a method of avoiding this fiddling that, naturally, has some drawbacks. For creating profiles really quickly, however, this technique is worthwhile employing. The drawbacks are largely down to accuracy – the more accurately you need to follow a complex profile, this faster the usefulness of this technique is going to be reduced. 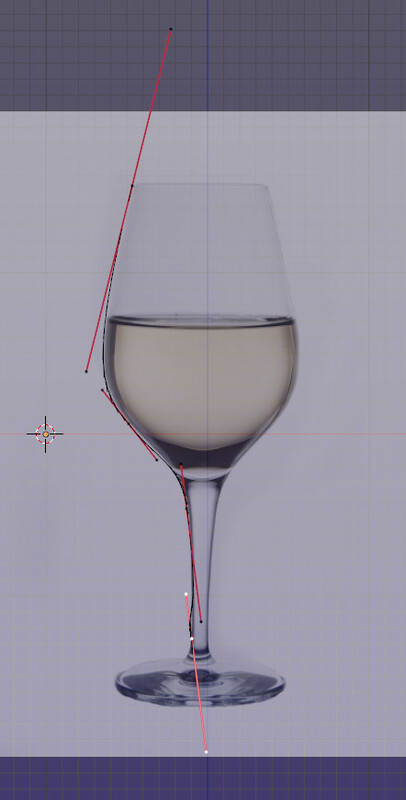 Like most things in life, to do a really great job with beziers, you have to put in the elbow grease. 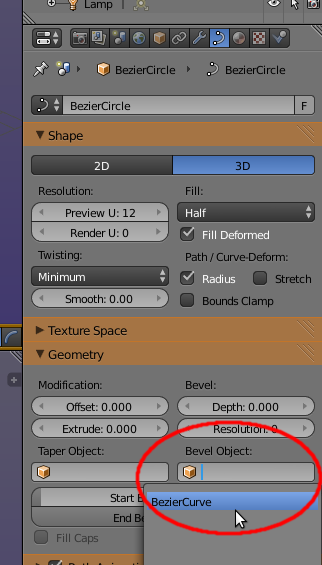 If you want to try this technique out, then delete the last (fourth) node you have selected, and then select the third (bottom) node, and press V. This will pop up the “Set Handle Type” menu, of which you should click on the “Automatic” option. Don’t worry about the fact that the handles have gone wonky; Keep Calm and Carry On Blending. Extrude a few more nodes, lining the up as you go along, and you will see how quickly you can create a profile. Don’t worry about the corners, that just a matter of changing the handles in those areas back to Aligned to get things running as before. Well, I’m going to delete those nodes, and get back to doing things the slow way. It’s at this point there are several things worth noting. First of all, the bottom of your profile will have to be completed from your imagination, as opposed to using the reference image in my case. That’s because we are trying to create a half-cross-section of a glass. 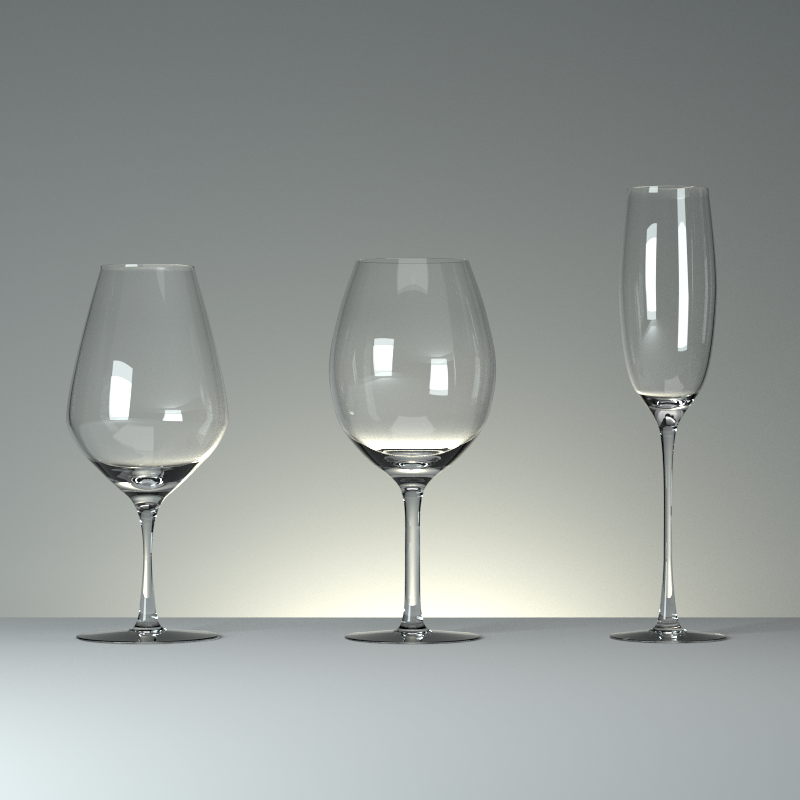 Now, all the wineglasses I have seen have very thin bases. If we follow the curvature of the base in the photo, we are going to get a blobby lump instead of a nice disc. 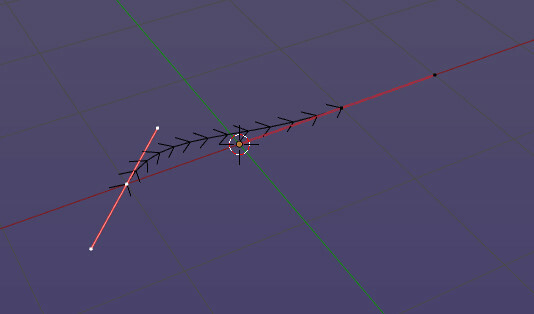 The next point are the normals (the fish bone-like chevrons that run down either side of the curve). Sine we do not really have any use for them in this project, we are going to switch them off, in the Curve Display panel which you will fin din the N panel. Lastly, since at this stage the reference image is of no further use, let’s switch it off in order to reduce screen clutter. In the above image you can see the Background Image check box, just uncheck that. All that is left to do at this point is to complete the inside wall of the glass. I will leave this as an exercise for the reader. 3. Place a Bezier circle somewhere useful. The location is not critical, but this will become your glass, so put it somewhere useful. 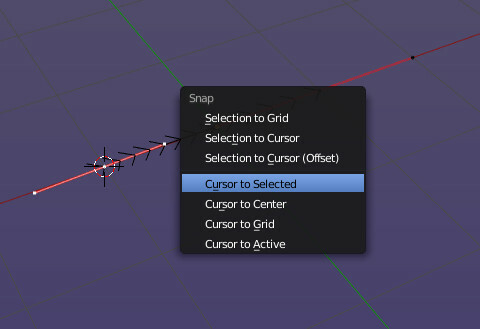 Place the 3D cursor at the x/y centre of your profile by selecting a node that is at the centre, and then pressing Shift-S to get the cursor snap menu up. Choose Cursor to Selected. 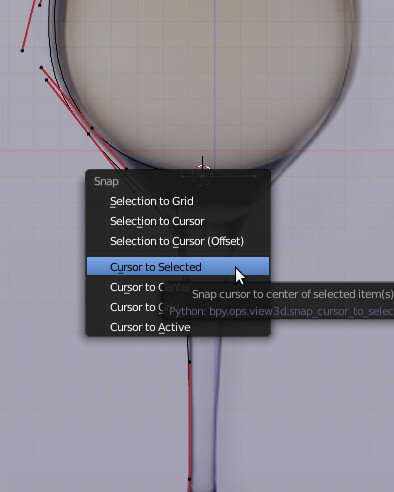 Now press Shift-A, and from the Curve menu add add a circle. 4. 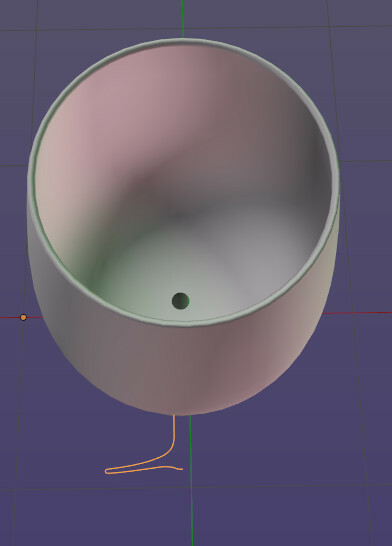 Assign the profile you made previously to the circle's Bevel Object field. Switch to the Object Data in the header of the Properties panel. 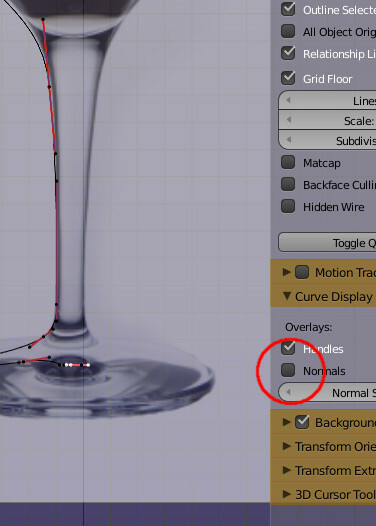 Now, in the Bevel Object field, select the wineglass profile you created previously (by default it will be name “BezierCurve”). If your screen now looks like this, don’t panic. I have seen scarier things on teh intarwebs. 5. Rotate your profile 90 degrees in Edit mode. 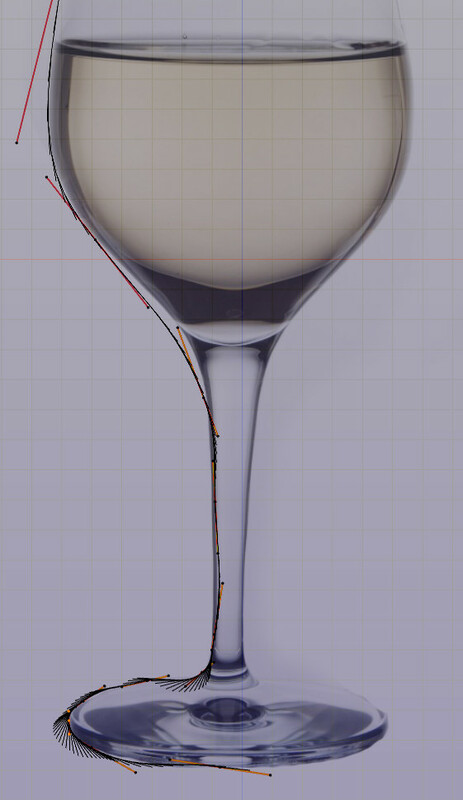 Select the wineglass profile and Tab into Edit mode. Now select all the nodes by pressing Ctrl-A. Now press R X -90 to get your first glimpse of a wineglass. It is almost there. There still is a small amount of tidying up to do, as well as making some important observations about working with curves that will save you a considerable amount of grief in the future. Cleanup - if you look inside your wineglass now, you will see there is a hole in the middle. We need to get rid of that by adjusting the profile curve. This hole is the result of your profile mesh not meeting in the middle. Fortunately this is easily resolved. Press 7 on the numpad to get into the overhead view. 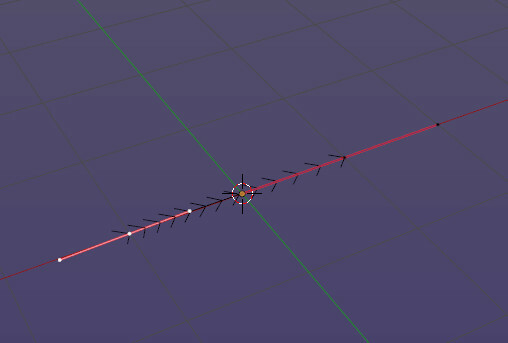 Now select the bottom node and move it through the x axis, by pressing G followed by X. Watch carefully as the hole is closed. Do like wise for the node above it. When using curves, the transformation matrix is by and large ignored. Put simply, you can rotate a profile curve in Object mode to your heart’s delight, it will not make the blindest difference to the outcome. Doing the same in Edit mode will play merry hell. This is incredibly useful, because it allows you to rotate your profile in Object mode to a convenient angle for later editing. As you can see from this example, curves represent a modelling paradigm that is quite different from pulling and pushing polygons. 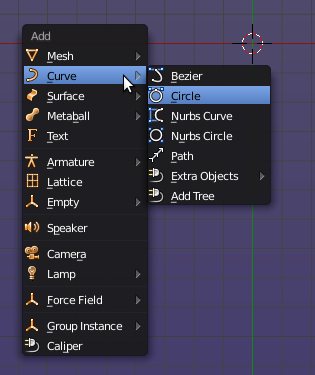 Curves are very useful for many other tasks as well, which I would like to highlight in future tutorials.